UUMAN offers two opportunities each week for contemplative practice. For both groups, those who wish may stay after for 30 to 45 minutes of discussion about our experiences. We gather almost every Saturday morning at 9:30 a.m. until about 11:00 a.m. We begin with approximately 45 minutes of practice which, among other things, includes a short reading, a simple a Capella hymn and thirty minutes of silent meditation. This is followed by a brief check in, a short topical reading, and a free flowing discussion of the reading. The meeting usually ends by 11:00 a.m. or shortly thereafter. At that point, some go home or off to do their Saturday errands, while others may choose to go to brunch for some extended fellowship time. In the last half of the 20th Century, Centering Prayer was adapted from early writings of Christian mystics (the Desert Fathers and Mothers, St. Theresa of Avila and St. John of the Cross, to name a few) but was also informed by the teachings of some of the eastern spiritual teachers who have been visiting the western world for the last couple of centuries. If you consider yourself a theist, this method of meditation will be perfect for you. But it can also easily be adapted to suit your needs if you are any type of non-theist (humanist, agnostic, atheist, Buddhist, etc.). And if that isn’t flexible enough for you, you are welcome to sit with us no matter what form of meditation you practice, as long as it’s silent. We ask first timers who do not already have a meditation practice they are comfortable with to come early and be in your seat by 9:00 a.m. for some basic instructions. For more information on this program contact Carolyn Bommarito or Mary McGrath via Centering@uuman.org. 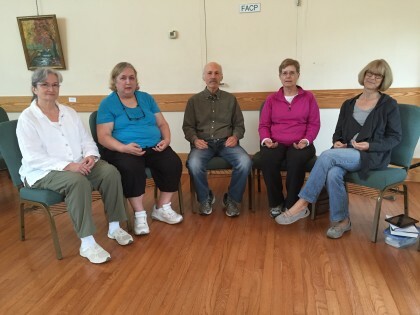 On Saturday afternoons at UUMAN from 1:00pm to 2:30pm, a group sits together in mindfulness meditation. Mindfulness meditation is a way of letting go of distractions and training the mind to become more fully aware of every aspect of our experience in every moment, as it unfolds into the next. Life is always experienced in the present moment, right now. Yet most of us spend most of our attention in thrall to the next rumination, the next anticipation, the next regret. We continuously reflect on, wallow in, and plan for our transitory pleasures and discomforts rather than appreciating what we have—until we’ve lost it. Mindfulness meditation teaches us to break that cycle. Jon Kabat-Zinn, founder of the Mindfulness-Based Stress Reduction program at the University of Massachusetts, has defined “mindfulness” as “paying attention in a particular way: on purpose, in the present moment, and nonjudgmentally.” While the practice of mindfulness meditation in the West comes to us via the ancient Buddhist tradition of Vipassana (the Pali word for “insight”), one need not accept the tenets of any particular religion or ideology to practice. This adaptable method of contemplation can be incorporated into any theology, preexisting religious practice, or scientific or secular worldview without doing violence to the practice. Moreover, researchers have found more and more scientific evidence that mindfulness leads to reduced stress, more focus, patience, resilience, and even better cognitive function. Brief instruction as needed and check-in for about 15 minutes followed by one or more 10 to 30 minute sittings, as those in attendance decide.